Don't let go. Whoa. The very first teaser poster has been revealed today to continue the build-up to the first trailer reveal tomorrow for Alfonso Cuarón's Gravity. 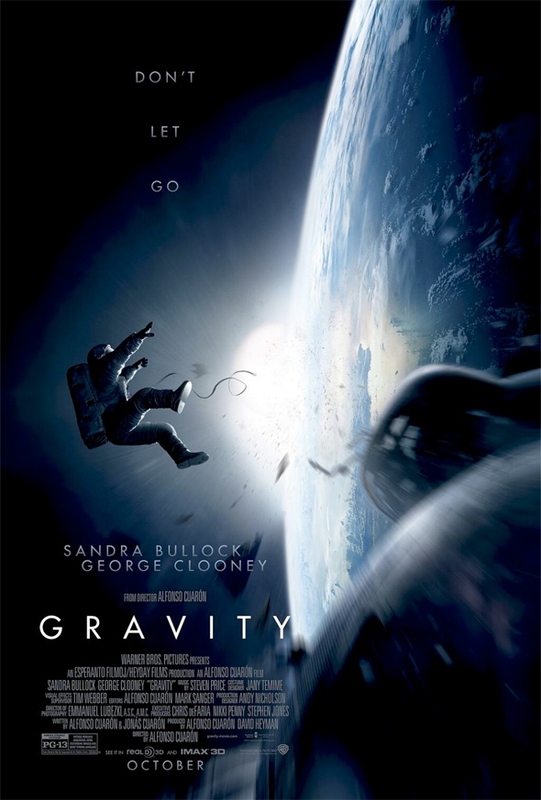 The highly anticipated, long-awaited space film stars George Clooney and Sandra Bullock as astronauts who get launched into space after a catastrophic accident sends them drifting away from Earth. We've been covering this movie for years and this is finally the very first bit of marketing material released publicly; they still haven't even released a real photo yet. This is a stunning poster, I'm impressed by it, but my only question - why is Cuarón's name so damn small? Dr. Stone (Bullock) is a brilliant medical engineer on her first shuttle mission, with veteran astronaut Matt Kowalsky (Clooney). But on a seemingly routine spacewalk, disaster strikes. The shuttle is destroyed, leaving Stone and Kowalsky completely alone—tethered to nothing but each other and spiraling out into the blackness. The deafening silence tells them they've lost any link to Earth… and any chance for rescue. Gravity is directed by visionary Mexican filmmaker Alfonso Cuarón, of Great Expectations, Y Tu Mamá También, Harry Potter and the Prisoner of Azkaban and Children of Men previously. The screenplay was written by Alfonso Cuarón and his son Jonás Cuarón. Warner Bros delayed Gravity from its initial release in 2012 and now his it scheduled to hit theaters on October 4th later this year. Watch the first teaser trailer. The name of Cuaròn alone should be a reason to anticipate this movie. On topic: cool poster. Awaiting tomorrow's trailer. agreed. in fact, while i normally dislike that sort of thing, could they not have had in smallish print, 'from the director of Children of Men'? would have loved a really stark drifting poster, without the flash and speed, to give a real sense of the vacuum of space. but i do like this poster. we're so used to mediocrity nowadays that it's a nice change. This movie is going to be groundbreaking. I've read, probably on this site mind you, that Alfonso took some 18 minute long shots. That in itself is incredible. By the way i don't find this poster amazing, Just a regular image of things happening in the movie. We all see astronauts flying into space before. Alex said Stunning, not Amazing !! Where are the big Photoshopped heads? Ha I love it! Great poster. How did I not know about this film before?! Looks like an umbilical cord.. The astronaut is being birthed in space. Bullock gets top billing, eh? I think this is her first big film after her Oscar win. On my must see list. Children of Men was great. Sold. I think i`ve allready seen this: in the end they`re both eaten by sharks. Thoe original was called "open water". Yeee almost like Open Water, but in space. Excited for this movie, but I have a feeling that the ending will leave me feeling sad.